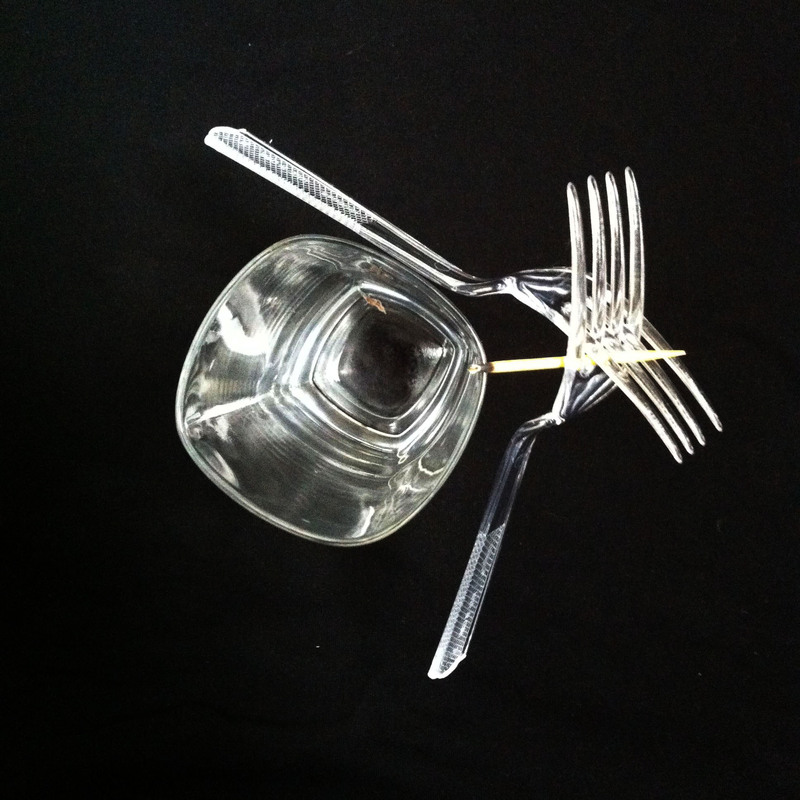 Two forks and a pair of toothpicks are all you need to perform an amazing balancing act (figure 7). Use this demonstration to teach students the fundamentals about "center of mass". A basic tutorial on center of mass concepts is included. Lecture slides are attached. Fig. 1: Massachusetts hanging from the northeast corner of the state. The vertical dashed line must pass through the center of mass. Fig. 2: Massachusetts hanging from Boston (the red dot). The blue dot indicates the center of Mass. Fig. 3: Two plastic forks with their tines wedged together. 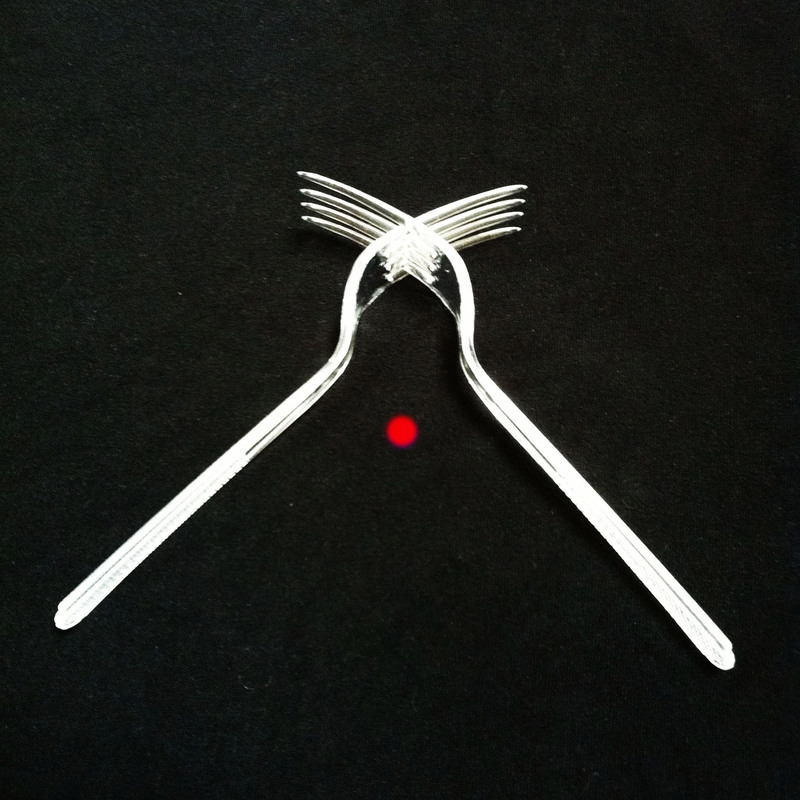 The center of mass of the forks is located at the red dot. Fig. 4: Forks balanced on a finger tip, with the aid of a toothpick. Note how the toothpick is threaded through the upper slot of each fork. Fig. 5: Forks balanced on the rim of a glass. Fig. 6: Overhead view after the end of the toothpick has burned off. Fig. 7: Forks balanced above a salt shaker. Take a book and try to balance it on the eraser end of a pencil. When you get it to balance, you'll notice that the eraser is just below the center of the book. This center is known as the "center of mass" (COM), or sometimes "center of gravity" (COG). The center of mass of an object is a balance point. Support the object directly under the center of mass and it will balance, no matter which direction you orient the object. Finding the center of mass of a symmetric object like a book is fairly easy; it's midway between the edges as you'd expect. Finding the center of mass of an irregularly shaped object is a little harder, but there is a surefire technique that will lead you to it. Take an irregularly-shaped object, like Massachusetts say, and hang it from the northeast corner of the state (figure 1). 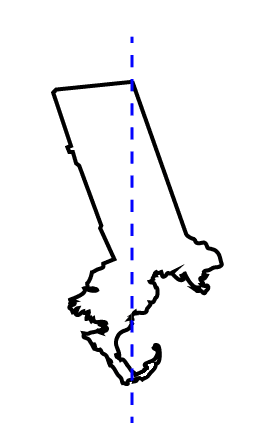 Half the weight of Massachusetts lies to the left of the vertical dashed blue line and half lies to the right of the line. (Otherwise, the state would tilt to a new position.) The center of mass must therefore be somewhere along this line. Now hang the state from Boston (red dot in figure 2). Once again, half the weight of the state lies to the left of the red line and half to the right. 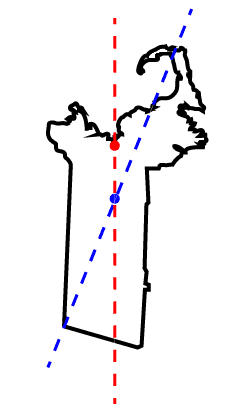 The center of mass must be at the intersection of the red and blue lines (blue dot in figure 2). No matter how you hang the state, the vertical line down from the hook will always pass through the blue dot. This location is the center of Mass., just south of Worcester. In contrast, the Boston is the center of the universe, but only according to Bostonians. You can now balance the state of Massachusetts on a pencil by putting the point directly underneath Worcester. The center of mass of an object doesn't necessarily have to be inside the object. Take two forks and wedge the tines together as in figure 3. The center of mass of the forks is located in between the two forks, at the red dot in figure 3. Since there is nothing at that location, it would be hard to balance the forks right at that point. There's nothing there for the support to hold up. We can fix the situation by adding a toothpick that reaches back to the center of mass. 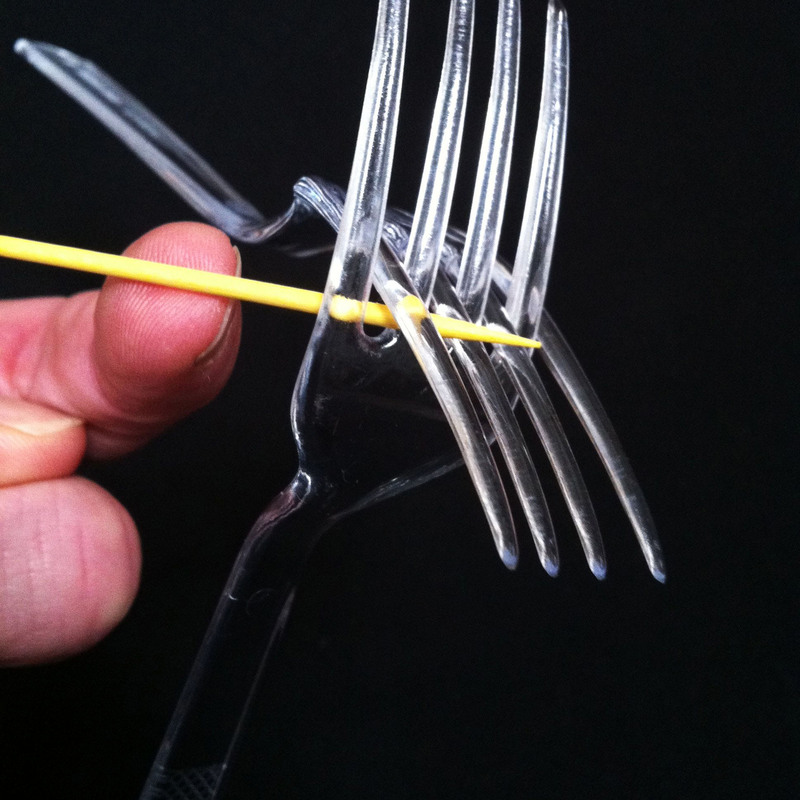 Figure 3 shows the forks balanced on a fingertip with the aid of the toothpick. Alternatively, we can rest the center of mass on the rim of a glass (figure 4). This makes for an improbable looking balance. Although the center of mass really is supported by the rim of the glass, it looks like the forks are balanced way out beyond the edge of the glass. It's hard to appreciate by eye that the handles of the forks are balancing in the other direction. The effect can be made more dramatic by removing the portion of the toothpick inside the glass. This piece weighs so little that removing it will hardly affect the center of mass, and the forks should remain balanced. To do it, light the end of the toothpick inside the glass and let it burn all the way to the rim. The flame should go out just as it reaches the rim. Let the toothpick cool and knock off any remaining ash. Now the forks are balanced right at the burnt end of the tooth pick (figure 6). 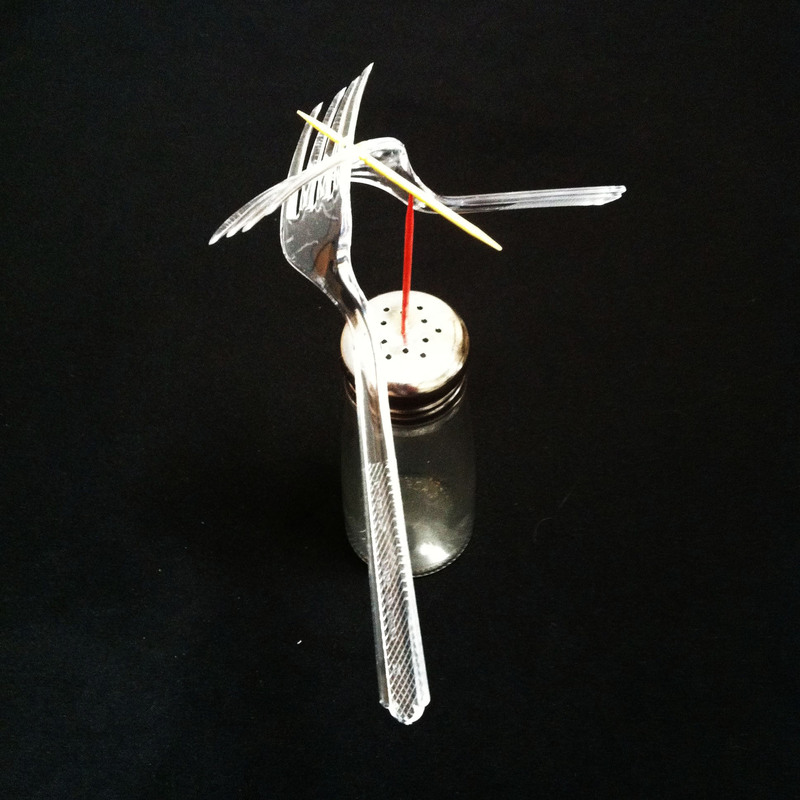 For an even more impressive display, you can balance the forks on top of another upright toothpick as in figure 7. Use round toothpicks rather than flat ones; it's hard to get the flat toothpicks lined up correctly. We used a salt shaker to hold the vertical toothpick, but any support will do. You can even tape the toothpick to the side of your glass. Lara Jacobs at the TEDxEdmonton conference shows how far one can go in constructing a chain of center of mass balance points. Let her performance inspire you. Video of Lara Jacobs performing her famous balance act, which has played at Cirque du Soleil. Toothpicks and plastic forks are cheap enough to outfit an entire class. It's worth letting students try their hand at balancing forks on their own. 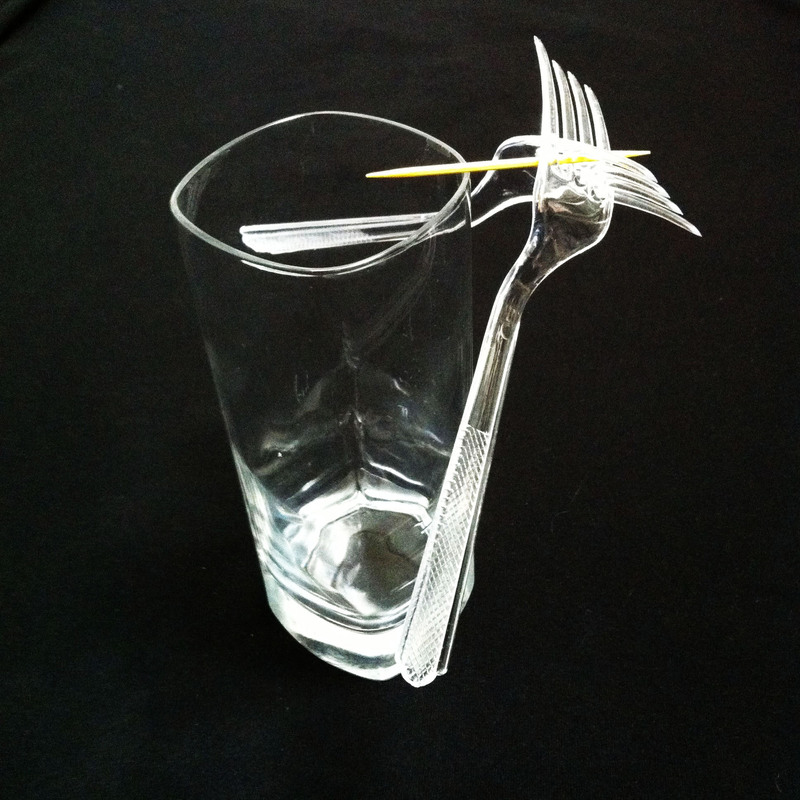 Turn it into a game to see who can balance the most forks on the rim of a glass.